The support you receive during your search will come not just from your investors, other searchers, personal friends, and advisors, but also from the “significant other” in your life, whether that be your spouse if married, your partner in an affianced couple, or a simply in a long-term relationship. While not at your side during the day, they are with you in the evenings, weekends and early mornings as you head off for another day of searching for the business you want to own or operating it. You owe it to your “life” partner to prepare them for what to expect as you start down the search path, which the most recent Stanford study on search says averages 7 years, with 5 spent running the business. Paul Thomson at Scottish American attributes the early stages of his search process as the primary cause for him becoming “un-engaged” with his fiancée at the time. It does not have to be like this for you. For this blog post, I reached out to a dozen “significant others” of searchers, including my own, who were willing to share their own observations, some with attribution and others without, about how the search impacted their partners and themselves, and what advice they might give to others. A few searchers also agreed to share their own tips and observations on how to navigate these relationships through “for better or for worse and for search!” This post can be used to raise the issues and initiate the dialog with your own life partner wherever you are in your journey. As covered in blog posts on When to search? and Is search right for you?, there are lot of questions that you have to ask yourself about both timing and advisability of searching. You certainly want to be making this commitment for the correct reasons. More importantly, you want these answers for both yourself and your significant other. Many searchers see the requirement to “relocate” as a deal breaker for “us”. Oftentimes, this comes up after finishing an MBA program that also required a relocation, with the promise that the next step would be a more permanent location. The desire to “settle down” into a stable location is very strong for all but perhaps those with military backgrounds. Investors of funded searchers are expecting no restrictions in geography. A self-funded search can allow for a limited geography and reduce this uncertainty. There is a heightened time commitment to search, a lack of routine and sporadically very long work hours resulting in an inability to commit to social events. Mary Ellen (Hammond) Mondi reflected that “Andrew was the hardest boss (on himself) he’d ever had, and he needed my help with establishing boundaries. He could have easily worked all the time on his search”. Crowding into her own time, Risa Roppongi pointed out that, “Jake’s hours were much less defined than traditional work hours with frequent calls during family/weekend time”. Another said: “A very rigid daily/weekly schedule affected his sleep schedules, phone call availability and our own recreational choices”. One spouse saw how difficult it was for her partner to be “Working alone, he was feeling very isolated”. Another pointed out that “It was a difficult transition to work in a secluded environment given their previous work experience – it is very lonely to work as a searcher”. Another observed: “I felt like I was sometimes the only person he could talk about his feelings with”. Money issues, a common source of strain in relationships, can be heightened in the search process, especially self-funded. As one significant other said: “He became committed to spending money in the most frugal ways possible, which put a strain on our relationship.” Another reflected, “Getting used to living on a budget, unlike before business school, was quite a change for both of us.” One commented, “We really were changing our lifestyle to cut back expenses so that we didn’t dive into our savings”. Not everyone saw hardship, as Holly Byrd reported “I have noticed that Jon’s confidence has risen. I have seen him grow and develop into an even stronger person.” Mary Ellen (Hammond) Mondi also saw significant positive changes: “His creative problem solving side came out as he tackled marketing, financing and leadership questions. It was awesome to me how much he grew in each of those areas as he pushed himself to learn more, think differently and be nimble.” Clearly, the search path to entrepreneurship is paved with self-development! Another shared, “I kept thinking that he is so excited about this, so what happens if it doesn’t work out? Will he be depressed, question himself and his decisions?”. Other doubts lingered, “Has he made the right decision to do this? What happens if he doesn’t succeed in this?”. 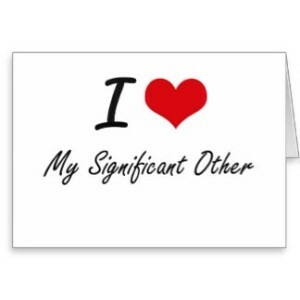 As a way to “pay it forward”, spouses and significant others are generally willing to share their observations. Many reflected how important it was for them to seek out others in their situation. They recognized the value of the searcher learning from other searchers but also how effective for them it was to be able to speak with other spouses/partners. I recommend that searchers provide to their own significant others 3 contacts for “due diligence” to reach out to before they make their own final commitment to search. These connections should stay in place after the search is started and extend while operating the company; an important “significant other network” for significant others to cultivate. Around the time commitments, Diana Medoff says, “Don’t get too attached to deadlines. We made them and blew through them regularly.” Mary Ellen and Andrew Mondi found “We put a premium on setting aside quality time together every day we were together (since we both traveled) – to cook dinner with each other once I got home from work, go to the gym, on a walk or go play 9 holes of golf before it got too dark”. For self-funded searchers it is important to have a discussion about making personal guarantees to the bank that may have consequential impact on your lives and financial security. Perhaps early in your career, there may not be much to lose; however for mid and late career searchers, you partner needs to understand the ramifications if the business you purchase has financial difficulties and the bank “calls the loan”. Jake Nicholson shared, “I’d also say the amount of search detail you should share with your partner depends largely on his or her personality. In my case, the more I shared the more nervous Risa became, so we agreed to share on an as-needed basis.” Doren Spinner observed, “A fresh set of eyes and the opinion from someone who isn’t living it all day long can offer some real insight. Your spouse doesn’t need an MBA to explain the actions of the seller/investor/banker that seems strange to you”. Most searchers introduce their spouses to prospective sellers during the LOI stage, and some even at the preliminary negotiations of an IOI. It is not uncommon to have multiple instances of dinners, lunches or simple meetings that include spouses. In some instances, the sellers spouse is also engaged in the business and wants to “assess” the “couple” that is considering buying the business. More often the purpose is to raise the trust level between the seller and the searcher, just another part of the process your significant other needs to be prepared for. And more importantly, the disappointment when/if the “deal” falls apart. From my own experience, I learned that relationships take significant effort and cannot be taken for granted. It is hard work and demands strong communication with each other. Recognizing the value of sharing what the search process is about can be a great first step toward starting this dialog with your partner. Feel free to share some of your own best practices or experiences in dealing with these issues in the blog comments. I encourage comments and dialog, allowing all in the community to learn from both my views and the views of others – a virtuous learning cycle. Jump right in! I frequently update individual blog posts, add to the Reference section and Search tips, so visit the www.jimsteinsharpe.com website regularly. Good post, Jim. After reading it, I thought to myself that there may be some benefits to being a solo searcher, aka “solopreneur” after all!